ANCHORAGE -- A search is underway for a plane carrying four people that left Port Alsworth Wednesday morning bound for Anchorage, according to Clint Johnson, spokesperson with the National Transportation Safety Board, CBS affiliate KTVA reports. 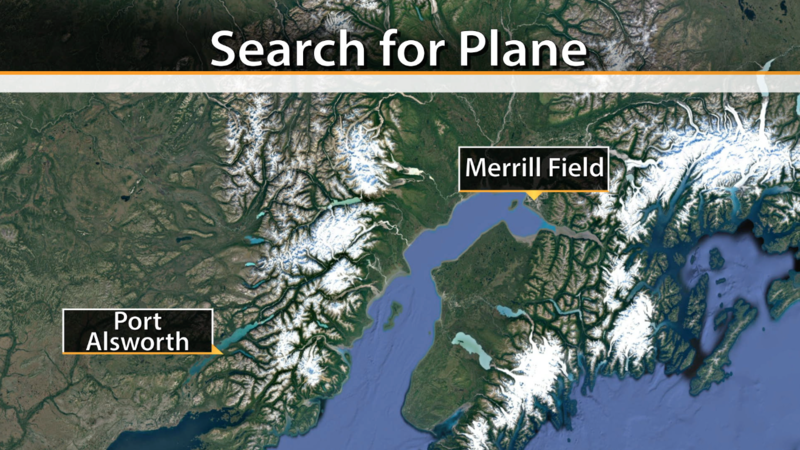 The plane left Port Alsworth around 10:30 a.m. and never arrived at it’s destination of Merrill Field, says Johnson. Four people were on board the plane when it left, according to Sgt. Edward Eagerton with the Alaska Rescue Coordination Center. The plane was headed through Lake Clark pass on its way to Anchorage and was scheduled to arrive around 12 p.m. Wednesday. The Alaska Air National Guard has sent two C-130 airplanes to assist in the search effort, says Eagerton. One of the C-130’s had a para-rescue squad from California on board. The group is currently in Alaska on a training mission. A HH-60 Pave Hawk helicopter from Eilson Air Force Base is also assisting in the search effort, says Eagerton. In a separate incident, one person is confirmed dead following a plane crash near Fairbanks, according to a spokesperson with the National Transportation Safety Board, CBS affiliate KTVA reports. The Fairbanks Daily Newsminer, citing his widow, reports the pilot is former Republican Rep. Mike Kelly, brother of current Fairbanks lawmaker Pete Kelly, KTVA reports. The plane crash occurred around 1:30 p.m. Wednesday on military land about 17 miles southeast of Fairbanks, NTSB spokesperson Clint Johnson confirms. A military helicopter crew was the first to respond to the incident, said Johnson. The pilot, the only person on board the civilian airplane, was pronounced dead at the scene by first responders. The two seater American Champion Citabria crash on Fort Wainwright land, according to an online dispatch from Alaska State Troopers. Johnson said the NTSB will be sending a crew to the site Thursday morning to investigate. He also said there were no restrictions in place preventing the pilot from flying through the airspace above the military land. The pilot has tentatively been identified and troopers have notified the victim’s family, according to AST. The pilot’s name will be released once the identity has been confirmed by the State Medical Examiner’s Office.